I always feel as though there is a lot of pressure nowadays on us as the younger generation to do well academically and to achieve. Sometimes we so caught up in targets and goals that we forget to do what makes us happy. Whether that be photography, writing or playing your favourite sport. For me, my blog is place where I can be my self and happy. I set up this blog so I share my thoughts and advice on the things that occur in my daily life, so they could help you guys if you need it. I shouldn't be embarrassed of it or hold back for that matter. I am going to carry on blogging no matter what as it makes me happy and it is my escape from the stress and overthinking. 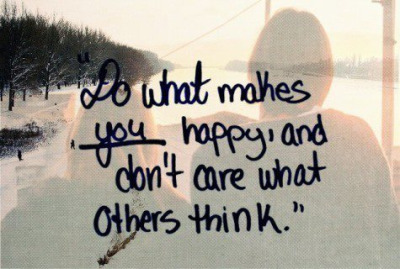 I just want anyone reading this to know, you should do what makes you happy too, regardless of what ANYONE thinks.